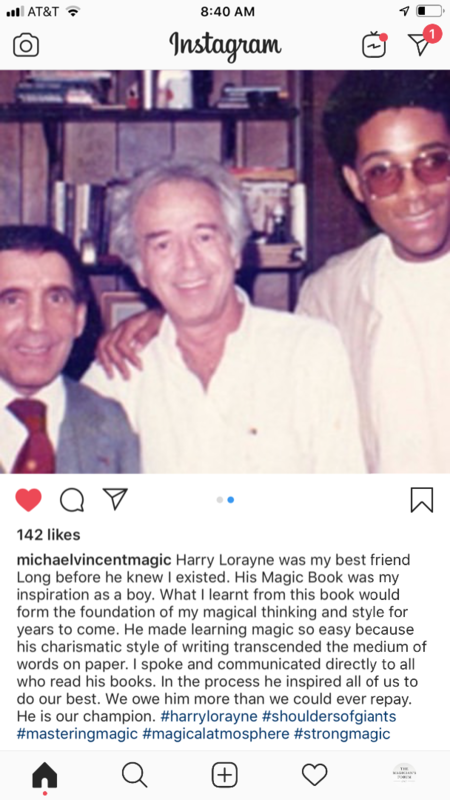 I just saw this sweet post on Instagram from Michael Vincent about his friendship with Harry. I feel similarly blessed to count Harry as a friend. Rudy, thanks for sharing. I wonder how many others here feel the same. I know I could "hear" Harry's voice as I read Apocalypse. He is unique in the way he can connect with the reader. I can't imagine how many people got into magic because of Harry because of his books and video's. Watching him perform just made you want to learn all about card magic and once you bought one of his books you're were hooked. I have never met Harry but only live about 2 1/2 hours from him and would love to meet up with Mr. Lorayne to say thank you for getting me into magic and making this a fun hobby for me. Hi RayJ, I hear his voice when I’m reading his books too! It makes learning from them so easy and engaging. Thanks for "them kind words," guys. But, interesting - it seems that not very many here want to read, or know about, the good stuff. Out of all the members here - I'm betting that maybe TEN - if that many - have purchased my last book, AND FINALLY! That'something I'll never understand. Anyway - if it's true that many here don't even know about it --- go to harryloraynemagic.com - I believe that the first thing you'll see is the ad that ran for that book. If you care at all for fantastic impromptu card effects/routines/ideas --- don't miss out!! Good edit! Pg. 75 it is. And Finally! is on my shelf. I'm a bit slow and still working on Special Effects. And still no response - not one order. Got any left you're willing to sell? No, sorry, I have no copies of JAW DROPPERS ONE left to sell. And, still not ONE order for AND FINALLY! That's what I'm talking about! A couple of posts were deleted - I don't really know why. No dirty language was used!! Sent you an email explanation earlier. Yes; received. Just didn't quite agree. But - unimportant. And - still not ONE order!!! Quick, before I change my mind. Order JAW DROPPERS TWO and AND FINALLY! together and save/take 20% off advertised prices. Include ONLY MY APOCALYPSE at same time and save/take 22% off advertised prices. Not sure of cost? - email me and we'll work it out! Books autographed only on request. Best - Harry L.
If interested - my MEMORY POWER COURSE is going only downloadable soon. Have just a few of the current (check it out at harrylorayne.com) left. Get it for $121.50 instead of the $163.90 (out of U.S.A. - email me and we'll work it out).